As parents we all like to think that we rule the roost, but ultimately we know that when it comes to arranging the family summer vacation, it’s probably the kids that will have the biggest influence in that decision. That’s why we asked some of our Youth Influencers about what they love about Penticton – surprisingly some of the things they talk about are just as much fun for the grown ups as they are for the kids. If you want to take a vacation this year, you better come to Penticton or else you are missing out. There are plenty of amazing and fun activities and sports to do here in Penticton. If you like to drink wine you can send your children to the community center for a swimming lesson or day camp and go for a wine tour. There are plenty of wineries on your way to Naramata. If you feel like going for a swim you are in luck. There are two lakes with amazing beaches. The lakes are named Okanagan Lake and Skaha Lake. If you want to go boating you can go and rent a boat along the beach. We have a skate park located near Okanagan Lake right beside a fun park named LocoLanding. You can go and play some mini golf or have some fun on the go-karts. There is also an amazing thing called the Wibit. It is an inflatable playground floating on Okanagan Lake. If you take a trip to Penticton, I guarantee you that it will be the highlight of your year. 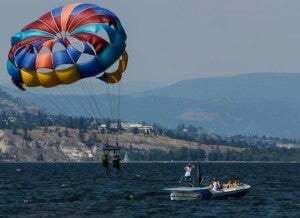 This is how to see all Penticton has in the summer. On your first day of vacation you might want to do something very adventurous, I would suggest going para-sailing, it costs around $80 dollars per person but you will definitely have a great time. On your second day in Penticton you might want to go for a delicious dessert so my suggestion is to go to Very Berry, it’s a really good frozen yogurt place with lots of toppings. On your third day you should definitely go to the beach, Okanagan Lake has a Wibit which is a bouncy house on water, and Skaha Lake has a water park and a park… and then repeat. 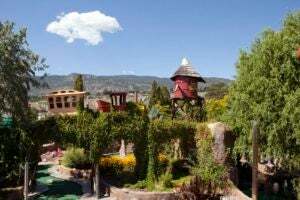 LocoLanding Adventure Park is one of my favorite things to go to in Penticton. LocoLanding is located right by Okanagan Lake. Why you might ask? Well, LocoLanding is a family orientated place. There are multiple activities for the whole family, from big to small including: mini golf, go-karts and much more. For example monkey motion is a very fun one – you can jump up and down and do flips on this activity. So if you can’t do flips on the ground and you really want to learn this would be a great option for you. There is also a concession stand so if you are tired you can get a variety of yummy foods, my favorite by far is the huge milkshake with a cake on the top and it’s only at LocoLanding. Living in Penticton is amazing there are so many activities you can do. One of my favorite activities is going to the Wibit. The Wibit is like a big floatable playground, on Okanagan Lake. In Penticton, summer is my favorite time because it so much fun to go swimming in the lake and to go boating, or even if you just want to get a tan. Also in the summer there is this amazing thing called the farmers’ market. People come to the farmers’ market to have a good time, browse around. There are kiosks, clothing huts, jewelry huts, people who sell vegetables and fruits. But my absolute favorite thing is driving through Naramata to an orchard to help pick cherries for all of the wineries that are up there. will you have the wibbit this summer? Yes the Wibit waterpark will be returning to Penticton this Summer.